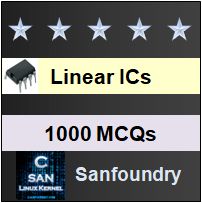 This set of Linear Integrated Circuit Multiple Choice Questions & Answers (MCQs) focuses on “DAC / ADC Specification”. 1. Find out the resolution of 8 bit DAC/ADC? ∴ Resolution =28=256 possible output values. Explanation: Non-linearity is the measure of deviation of actual output (ε) from the ideal straight line output (△). Therefore, it is expressed as percentage of full scale voltage (ε/△). 3. A binary input 000 is fed to a 3bit DAC/ADC. The resultant output is 101. Find the type of error? Explanation: Offset error implies that the output of the DAC is not zero when the binary inputs are all zero. 4. How many equal intervals are present in a 14-bit D-A converter? Explanation: A 14-bit D-A converter has 2n-1 equal interval =214-1=16384-1=16383. Explanation: Resolution of 6 bit DAC =VFS% /(2n-1) =(VFS×100)/(26-1) = 1.588% of VFS and the number of interval is 26-1=63. => Thus, resolution of a 6 bit DAC can be stated as a resolution of 1 part in 63. 6. Find the resolution of a 10-bit AD converter for an input range of 10v? Explanation: Resolution (in volts) VFS /(2n -1)= 10 /(210 -1) =10/1023 =9.77mv. Explanation: A good converter exhibits a linearity error of less than ±(1/2)LSB. Explanation: Relative accuracy is the maximum deviation after gain and offset error has been removed. Explanation: In a DAC, the analog input is converted into digital output. So, a monotonic DAC increases its analog output with increase in its digital output. For example, if the output decreases when input code change from 001 to 010, it is said to be a non-monotonic DAC. Explanation: All the commercially available DACs are monotonic because the linearity error never exceeds ± (1/2) LSB at each output level. Explanation: Settling time represents the time taken for the output to settle within a specified band ± (1/2) LSB of its final value following a code change at the input (usually a full scale change).